This free printable Hotel Scavenger Hunt game is a great way for your kids to become more familiar with the hotel you are staying at. Many of these items they can search for in the room while you unpack. Some of the others they’ll find when you’re together in the lobby or wandering down your hallway. It’s a great way to burn off some of that extra energy after sitting in a vehicle or on a plane all day. When you arrive in a new hotel room, what is the first thing you look for? We’re adding new ideas for family fun every week! Never miss an update by following along on Pinterest, Twitter and Facebook. We’d love to have you as part of our community. 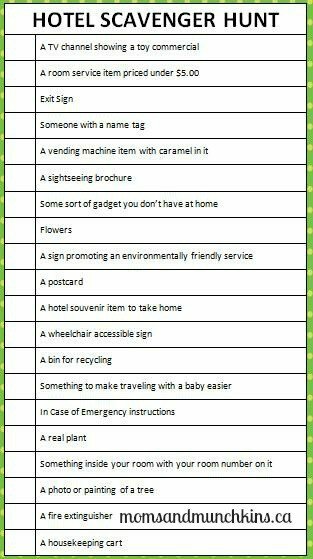 For more fun & free printable games, check out our Free Printable Game page filled with other freebies including more perfect for travel like an airport scavenger hunt, airport bingo, road trip bingo and more! We have plenty of free games to help pass the time while traveling. If you have any suggestions for games you’d like to see, let us know in the comments below. A great idea! I pinned this one to my Printables board on Pinterest. Thank you. How fun! We recently stayed at a hotel with the kids and this would have been so perfect. thanks for sharing! Cute idea! We are in a hotel now so perfect timing! What an awesome idea could have used this last week… going to definitely remember this for next time. What a neat idea! Thank you for sharing. The kids would love this. What a great and fun idea. We love playing games and keeping the kiddos busy while we’re away on trips, this sounds like a fun game that will come in handy, thanks!